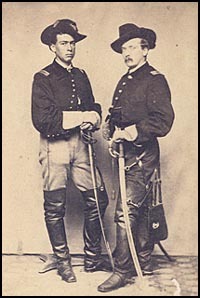 In 1855, the word cavalry was used for dragoons, for the first time, and the trimmings of hat and coat were prescribed yellow instead of orange. The first two regiments of cavalry, the First and the Second, were prescribed a most jaunty hat, and this word "hat" was used for the first time. This cavalry hat was of black felt, trimmed with gold cord looped up on the right side and fastened with an eagle, and the eagle was attached to its side. The number of the regiment was in front. For the field officers three black feathers were on the left side, for other officers two. The enlisted men wore a worsted instead of a gold cord; the letter of the company was substituted for the number of the regiment, and one black feather was allowed. The dragoons retained their old uniform. The general order of 1857 prescribing the uniform dress of the Army made no particular change except as regards the hat for officers and enlisted men, which was made of the best black felt. The dimensions were a brim width of three and one-fourth inches, and crown height of six and one-fourth inches. For officers the hat was bound with black silk, and for enlisted men stitched. The trimmings for general officers were the gold cord with acorn-shaped ends, an eagle, and three black ostrich feathers. A gold-embroidered wreath decorated the hat front, with the English characters "U. S." in silver. For officers of the general staff it was the same, except the cord was of black silk and gold; and below the rank of field officers, two ostrich feathers were allowed. The enlisted men were still allowed to have one feather. Their cords were worsted, the badges of yellow metal.